Qatar Airways is delighted to congratulate its home and hub, Hamad International Airport, (HIA) on being ranked fifth ‘Best Airport in the World’ at the Skytrax World Airport Awards 2018 that took place at the Passenger Terminal Expo in Stockholm, Sweden on 21 March. The award-winning airport moved up one place from last year, having received the title of sixth ‘Best Airport in the World’ at the Skytrax World Airport Awards in 2017. HIA is the only airport in the Middle East in the world’s top 10 airports of 2018. At the annual awards ceremony, HIA also took home the title of ‘Best Airport in the Middle East’ for the fourth year in a row, ‘Best Staff Service in the Middle East’ for the third year in a row and was ranked fourth ‘Best Airport for Shopping’ in the world, up one place from last year. The award wins recognise HIA’s innovative facilities, five-star customer service and state-of-the-art terminal, which accommodates more than 30 million passengers each year. HIA offers a world-class experience redefining what passengers expect from an airport. It is one of the world’s most technologically advanced airports with expansive retail options, leading dining facilities, exclusive lounges, and a hotel and wellness centre including a gym, squash court, swimming pool and spa. HIA was certified as a ‘5-Star Airport’ in January 2017 by Skytrax, and is one of only six airports in the world – and the only airport in the Middle East – to have earned this title. International air transport rating organisation Skytrax is renowned globally for conveying the passenger’s voice in airport and airline rankings. The Skytrax World Airport Awards are the most prestigious accolades for the world airport industry, voted for by air travellers in the largest, annual global airport customer satisfaction survey. 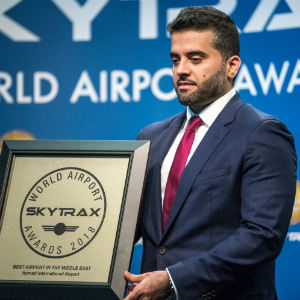 The Skytrax World Airport Awards are based on 12.85 million customer nominations across 110 nationalities of air travellers, and include 410 airports worldwide. The survey evaluates customer satisfaction across 39 key performance indicators for airport service and product, from check-in, arrivals, transfers, shopping, security and immigration, through to departure at the gate. One of the world’s fastest-growing airlines, Qatar Airways currently operates a modern fleet of more than 200 aircraft flying to business and leisure destinations across six continents. As part of its continued expansion plans, the airline also recently commenced service to both Chiang Mai and Pattaya, Thailand; Penang, Malaysia and Canberra, Australia. The airline plans to launch a host of new destinations in 2018-19, including London Gatwick and Cardiff, United Kingdom; Lisbon, Portugal; Tallinn, Estonia; Valletta, Malta; Cebu and Davao, Philippines; Langkawi, Malaysia; Da Nang, Vietnam; Bodrum, Antalya and Hatay, Turkey; Mykonos, Greece and Málaga, Spain.